Her style is as romantic and timeless as the city of Lisbon itself. That is precisely why the Evil Cake Genius is in love with everything this woman creates. 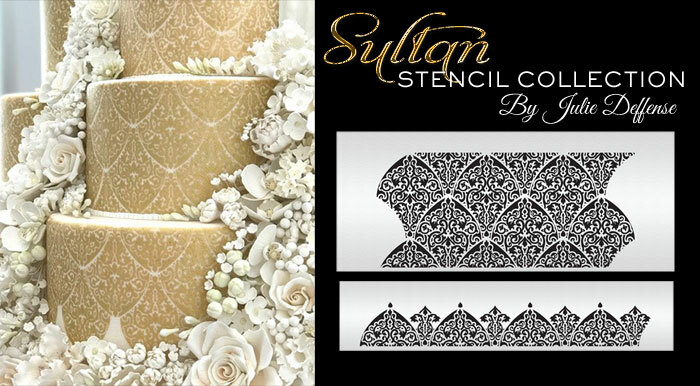 Both her Sultan and Sultan Border Stencils can be used with Royal Icing, Buttercream, or Airbrush, and they'll make any cake fit for a Sultan, Queen, Duchess, or a very elegant commoner such as yours truly. 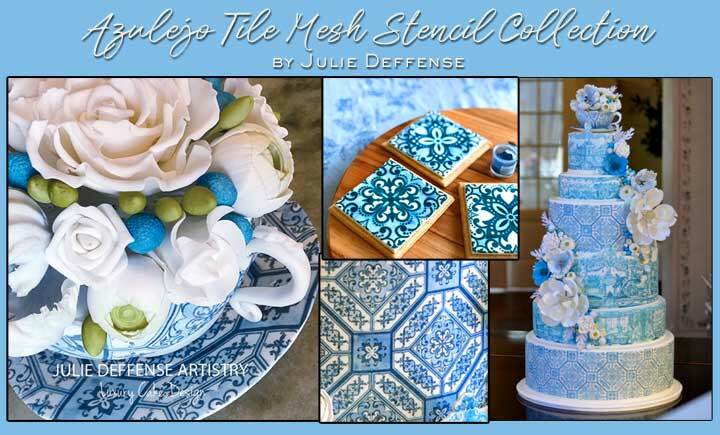 Based on Portuguese Azulejo Tiles, these Mesh Stencils are so beautifully detailed, that they'd stand alone, but with a tiny bit of filler color, they look so much like real tile...well, hell, just look at that edible teacup and saucer she made with them! Julie was kind enough to shoot a little video of her painting on this cake so you can see just how fast and easy it is! 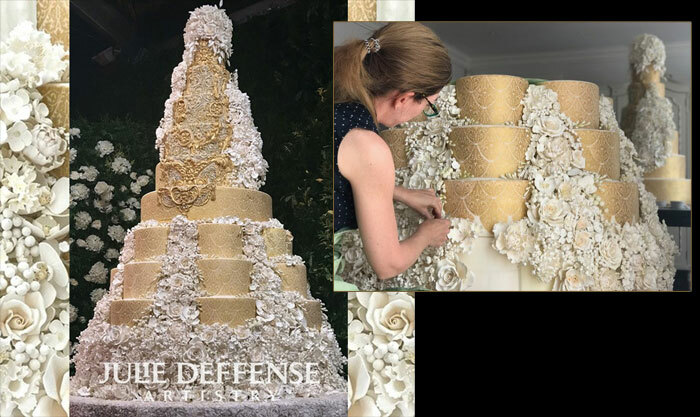 The Cookie Stencils looked so much like real tiles, that we made a Cake Sized Set of them sized perfectly to make 4" tall tiles out of fondant to decorate the sides of a standard height tier. Or go two high on a double barrel! And these are just her latest designs...read on for the full line of her beautiful stencil patterns. 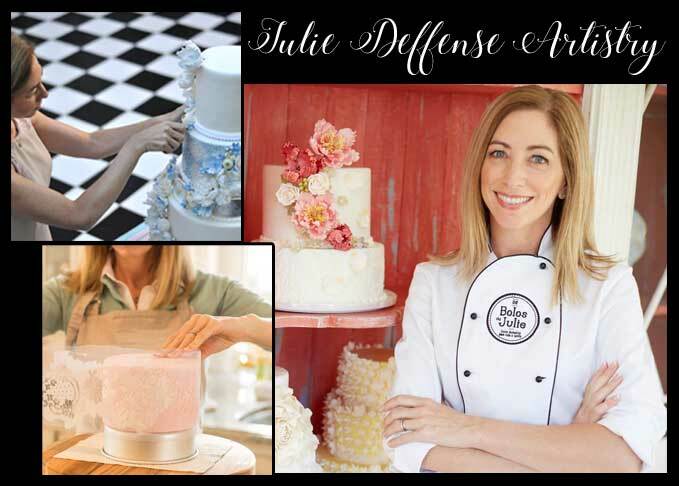 Julie Deffense is renowned on two continents for her cake artistry. She splits her time between Portugal and the United States, and we couldn't help but notice that she was doing some crazy beautiful stuff with our ECG stencils. Just take a look at this little beauty she made with our Alencon Lace Cartouche Stencil! Which is why when Julie asked us to do a custom stencil or two, we jumped at the chance to make them...and to add them to our site so that...so that YOU can use them too! Now, we can't guarantee that you're going to feel the sea air on your face and hear the haunting sounds of a Fado singer every time you use one of her stencils, but we're pretty sure you're going to love the results of using them nonetheless. Her Embroidered Lace Stencil collection is the most intricately detailed Acrylic Lace Stencil we've ever made. You can see each tiny zig zag of embroidery on each lace shape. 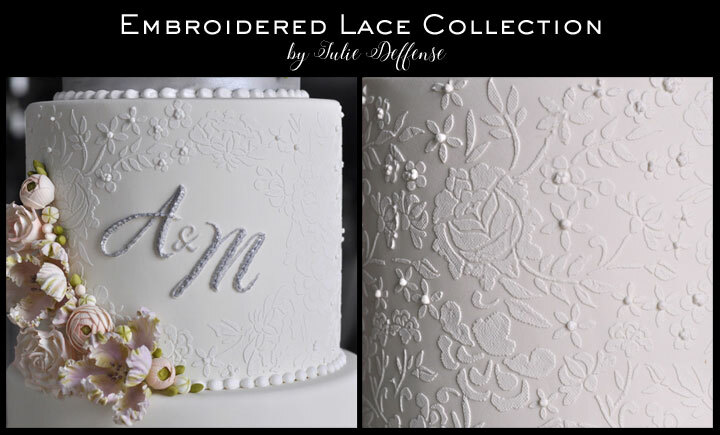 And to round it out, Julie added a matching lace pattern that has a perfect little oval frame cut out of it to accommodate a monogram. Not just any monogram,though! She designed a modern monogram especially for the look, and we turned it into one of our Mix and Match Monogram Sets! Simply fill the pre-cut holes in the stencil with the Monogram Letter Stencils of your choice, and stencil the lace and Monogram in one swipe! Julie overpiped the monogram in the photo for added texture, but the stenciled monogram is beautiful and elegant even without the added effort. This is BIG! 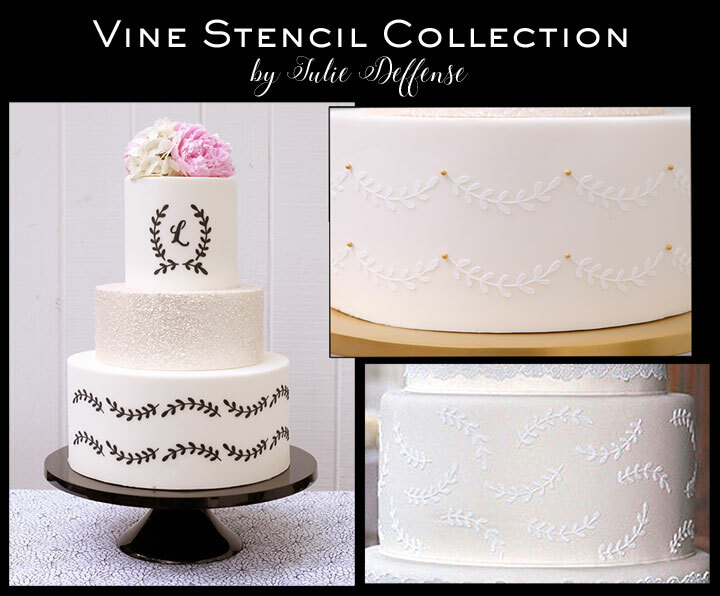 Our new Vine Monogram Stencil Set by Julie Deffense includes two sweet little vine pattern frames and 26 letter stencils so that you can create your own custom monogram on any cake or cookie! Can we get a Hallelujiah?!?! 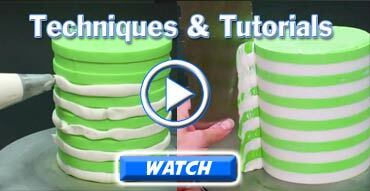 Just watch the video below to see the Evil Cake Genius try it out for the first time! But, it's not like Ms. Deffense to leave well enough alone. 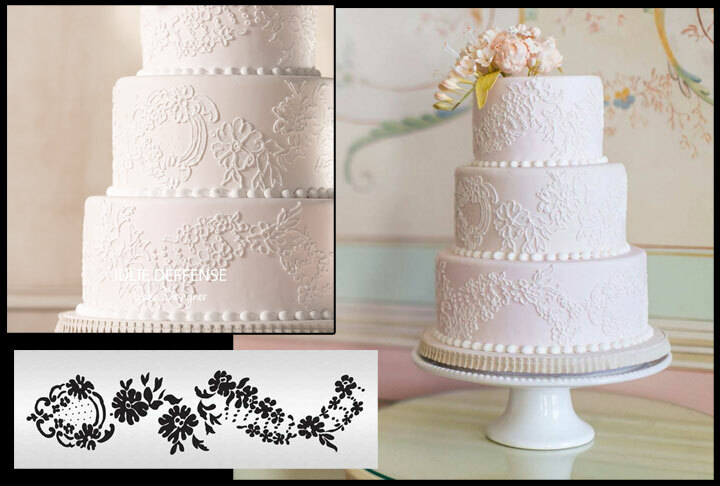 Just to make sure that you're able to make stunning multi tiered cakes with this, your new favorite monogram, she designed three matching vine pattern stencils that are sweeter than pastéis de nata (portuguese custard tarts, just trust the ECG on this, they're pretty fabulously sweet). Love these? Stay tuned!! Wedding season is just beginning! We have more stencils to add to Julie's line, so check back to see what's new from time to time.